Antibiotics are medications taken to fight infections caused by bacteria. When they first became available during World War II (1939-1945), antibiotics were called "wonder drugs" because of their stunning record for safety and effectiveness. Well-known antibiotics include penicillin, streptomycin, and erythromycin. Antibiotics are usually taken orally (by mouth) or given as inoculations. Bacteria are single-celled organisms that exist everywhere in nature and can have beneficial purposes. Most bacteria are harmless to humans. Disease may result, however, when an infectious type of bacteria enters the human body, by way of the nose or mouth or through a wound. Many types of bacteria reproduce by cell division (the one-celled organism divides into two identical organisms), a very rapid process that sometimes takes as little as 20 minutes. The chemicals bacteria release may be toxic (poisonous) to human cells or may interfere with cell function. Bacteria are responsible for such debilitating and even fatal human diseases as pneumonia, typhoid fever, Rocky Mountain Spotted Fever, and tuberculosis. Antibiotic drugs are prepared from natural compounds that are antagonistic (harmful) to bacteria. Some fungi and benign (harmless) bacteria can defend themselves against harmful bacteria by producing chemicals that destroy bacterial cells. Scientists and researchers have created many effective drugs for human use out of such bacteria as mold in the Penicillium family or Streptomyces griseus. These anti (against) biotic (life) compounds usually work by either damaging the harmful bacteria's cell membrane (the thin layer of animal or plant tissue that covers an organ or bodyily fluid) or preventing its growth. Scientists of the early 1800s first classified bacteria. In 1829 they established the name Bacterium as their genus (a grouping of species with common origins). Bacteriology was an experimental science that emerged slowly until a major breakthrough occurred in 1928 that led to the development of penicillin. Scottish doctor Sir Alexander Fleming (1881-1955; winner of the 1945 Nobel Prize in medicine with Howard Walter Florey and Ernst Boris Chain) was growing colorful patches of bacteria in covered dishes in his crowded St. Mary's Hospital Medical School laboratory. He noticed that a green mold had gotten into one of the dishes. Fleming knew that mold spores traveled through the air and could easily land and grow in any dish left uncovered. In this particular dish the bacteria closest to the green mold seemed to have disappeared or dissolved. 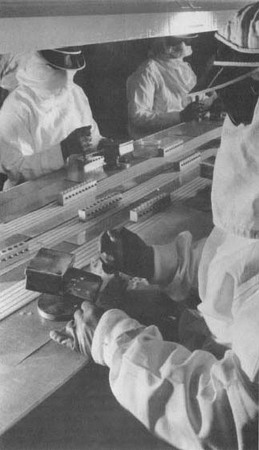 Fleming examined the mold carefully and photographed it. An associate identified the growth as Penicillium notatum. Curious about how the bacteria in this dish were killed, Fleming took the greenish "fluff in the dish and made a mixture that his laboratory workers called "mold juice." Fleming named the juice "penicillin" and gave it to some laboratory mice. He found that the penicillin killed only the harmful bacteria and not the healthy cells in the mice. This made Fleming's "mold juice" safer than any other known bacteria-killing substances. It was an incredible discovery. If this mold mixture could be made into a drug, then someone with an infection could be cured of disease without being harmed by the cure.Unfortunately, Fleming ran into difficulties turning penicillin into a drug because he was unable to purify and concentrate the substance. The next breakthrough came in 1939 from scientists studying microorganisms in soil and how these organisms helped to keep soil healthy. In 1939 American soil microbiologist Selman Abraham Waksman (1888-1973; winner of the 1952 Nobel Prize for medicine) was analyzing the antibacterial properties of soil organisms. Working on streptomycetes fungi at Rutgers University laboratory in Newark, New Jersey, Waksman invented the term "antibiotic" to describe a compound that would harm bacteria without being toxic to human cells. He isolated (separated) antibacterial agents from the streptomycetes, but he found them all to be toxic to human cells. In 1940 Florey (1898-1968; professor of pathology originally from Australia) and Chain (1906-1979; German biochemist who had fled Hitler's Germany) began to experiment with penicillin at Oxford University in England. After many experiments, the duo succeeded in purifying penicillin and began testing it on mice. When penicillin caused few side effects in the mice, Florey and Chain began testing it on humans. With the outbreak of World War II (1939-1945), wounded were crowding into hospitals. Florey and Chain's team of workers rushed to develop penicillin in large quantities to fight bacterial infections. By 1942 penicillin was being mass produced by British pharmaceutical companies. Through the distribution of penicillin, many soldiers were saved from the infections that developed after they were wounded in battle. Penicillin also reduced the rate at which people died from bacterial pneumonia. Where once pneumonia killed 60 to 80 percent of the people who came down with the lung infection, penicillin lowered the rate to 1 to 5 percent. Despite its effectiveness, penicillin did not cure every bacterial infection. Eventually scientists understood that the drug worked only against Gram-positive bacteria (a range of bacteria that reveal a blue stain in certain laboratory tests). During the early 1940s Waksman focused on Gramnegative bacteria (a range of bacteria that loses the blue stain). He eventually found a nontoxic compound derived from Streptomycetes griseus mold which he named "streptomycin." In January of 1944, he announced that this antibiotic could work against both Gram-positive and Gram-negative bacteria and was particularly effective against tuberculosis. Initially made only from natural substances, antibiotics were soon formulated from synthetic (non-living) or partly synthetic materials. In 1945 Benjamin Dugger, Y. Subbarow, and A. Dormbush discovered aureomycin, the first of the class of antibiotics known as tetracyclines. John Ehrlich and Quentin Bartz isolated another soil microbe in 1947 that chemists at Parke Davis & Company found could be synthesized (made) into an antibiotic. The new drug, chloramphenicol (an antibiotic that is antagonistic, or harmful, to a wide spectrum of bacteria), became one of the first bestselling synthetic drugs. Other synthetic antibiotics include terramycin, erythromycin, and bacitracin. Penicillin is packaged in a sterile atmosphere maintained by ultraviolet light. Operators must wear protective clothing that includes goggles and head coverings. Antibiotics may be injected with a needle and syringe or taken by mouth in pill or liquid form. They prevent bacterial cells from growing or dividing normally. For example, penicillin prevents bacteria from forming their cell walls. The compound in the antibiotic mimics (acts like) similar compounds in the bacterial cell wall. But when the antibiotic becomes part of the bacterial cell wall, it leaves a gap. The bacterium's cell contents are no longer properly encased and protected, so the contents spill out and the cell dies. An antibiotic may be very effective in halting the reproduction of bacteria at first. There are always some bacteria, however, that are naturally resistant to the drug. Soon the resistant strain is able to catch up and reproduce in strong numbers. Antibiotic resistance was noticed as early as the 1940s. Some authorities believe that overuse of antibiotics causes bacteria to become resistant. One example of overuse is in factory farming of poultry and livestock, in which antibiotics are routinely administered to animals as a preventive medicine to keep them from getting sick. Eventually, the antibiotics may fail to work because the infection is caused by resistant bacteria. The same phenomenon can be observed in humans. The U.S. Centers for Disease Control and Prevention (CDC) in Atlanta, Georgia, reported in January of 1996 that deaths from infectious diseases are on the upswing. According to the report, death from infectious diseases rose 58 percent between 1980 and 1992. (In 1980 infectious diseases caused 41 out of every 100,000 deaths. In 1992 infection was responsible for 65 out of every 100,000 deaths.) The CDC claims that antibiotics have been over-prescribed and improperly prescribed, which results in resistant bacteria (bacteria exposed to, but not killed by, antibiotics can mutate to make themselves immune to antibiotics). The resistant bacteria can then pass their resistance to other bacteria. When the resistant microbes produce illness in humans, antibiotics that have traditionally cured that disease no longer work. The CDC predicts the possibility of a post-antibiotic era—a time when antibiotics no longer work—and advises that antibiotics be used very carefully and only according to directions. Furthermore, before prescribing antibiotics, health care providers should first take a sample of the bacteria (which is then grown in a culture). This allows the bacteria to be clearly identified and indicates exactly which antibiotic should be prescribed. this was very useful for my biology project. are there any reliable sites that go into more detail on the possibility of the post-antibiotic era? im looking to reaserch it for my A2 project. Thank's for the information just want to ask,what are different bacteria in which thier toxins could be used as antibiotics? this is actually really helpful for my biology research! :) and then i had to use it on my coursework and it made me get a really good mark! thanks. It's not helpful, it doesn't have enough information for my science project. The way I am understanding is your asikng why does our body become immune to some antibiotics, and thus making them stop working. My sons doctor told me it was because if you keep using the same antibiotic over and over again, that the bacteria, can start to resist it because it is used to it being present in the body. For example my 16 month ol son has MRSA, I work in a drug facility, so I am around the jailed population alot, and I guess I brought it home with me, since he is so young he often gets outbreaks, and they need to be treated with IV antibiotics, but the prolem with MRSA is that there are only 3 or 4 antibiotics that work on it, Clindamycin, vancomycin, those are the 2 they usually give my son. I would say he has had about 6 outbreaks since he was 6 months old, and its been very hard because at any time those medications can stop working, thats why his doctor tries alternating the two hoping that his body does not become immune to one of them, because then we woudl run out of options very quickly. I hope this was helpful. This was helpful in providing me with info for my biology course work!! (Bacteridal function ).Is it correct ? When were the first IV antibiotics administered to children? what is the date this was written and the authors name?